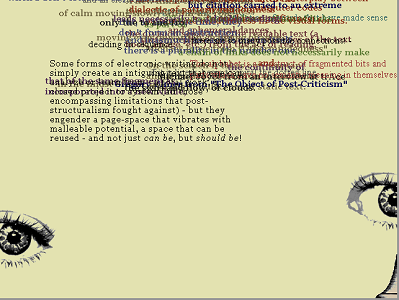 This kinetic collage poem is built out of text by Soderman and quotes from eight pieces written by theorists and writers whose work reflects upon the nature of writing in spaces other than the printed page. Cut into lines and blocks of text, each of these textual portions are anchored or set adrift in a “page_space” designed by Soderman to allow them to move and rearrange themselves into new textual combinations. In addition to encouraging readers to click on texts to get other quotes from the same source, Soderman places several objects into the space that trigger different events, such as a book that stops the textual movement when clicked. The behaviors triggered by each of the objects remind the readers of how configurable the space for digital writing can be by enacting some of the concepts brought forth by the quoted writers. This creative engagement of the potential Soderman saw for digital environments to radically reconfigure the interface of a page led to his 2005 Page Space experiment. Link to ELMCIP Knowledge Base entry.